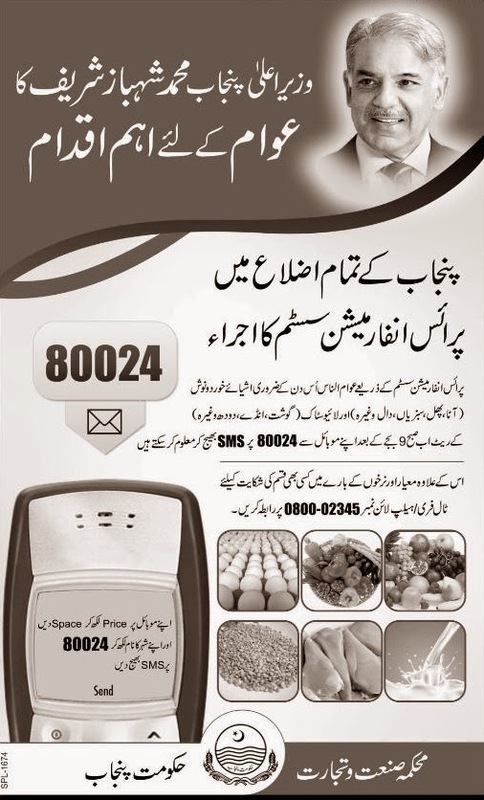 Punjab govt is working very good in Punjab and they launched many schemes and Programs for development of Punjab and Pakistan, They distributed laptops, Solar Panel, and many other scheme launched and now the Punjab Govt has launched SMS Based Price Information System. Punjab SMS Based Price Checking Online Scheme will be very helping scheme because it is the easiest way to finish the corruption from Punjab we can finish the Corruption but we should start on the Individual bases. Technology is a useful tool to improve governance; keeping that in mind the Government of Punjab has launched a short messaging service (SMS) based price information service for the residents of Punjab. So we should use the Technology for our benefits were we can get. To get the 36 essential grocery items including ‘Atta’, Rice, ‘Ghee’, Apple, Chicken, Mutton, Sugar, Milk, Onions, and many other items. This service is launched as an attempt to educate consumers with the price list issued by Government of Punjab. The mobile user will have to enter his/her city name and send the message to 80024 (more details on the mechanics of the service are provided below). The resulting reply will give price details of around All 36 Items regarding it. Here below we are providing it complete Procedure regarding it that how you can get the Instant result regarding price that are fixed by Punjab Govt. It An application base system for prices would also be a good idea. For instance if you want to receive prices for Lahore and surrounding areas type ‘Price Lahore’ and send it to 80024. An SMS to 80024 is charged at Rs 1.43 inclusive of Tax. On a related note, just in case if you experience any difference in prices for your local market, then go ahead and register complaint with Punjab Government at their toll free number 0800-02346. For the Further Details Regarding Punjab Govt Daily SMS Price System Launched for Updates for All Goods you must visit regular and if you have any query so you should comment us here in below comment section.